This book includes techniques for improving your cooperation with the business. The goal is to give you two key skills: discovering the business needs and managing the conversation in a way that will enable you to collect precise and useful information. Bartyzel wrote:Cooperation between the business and IT is governed by two harmful stereotypes: IT claims that in the business they do not know what they want, while the business is convinced that IT does not think with a business mindset. Sometimes, we entrench ourselves in these positions to such an extent that we are unable to find a thread of understanding, which is necessary to develop valuable software. This book includes a set of cut-and-dried techniques for improving your cooperation with the business. The main goal of this publication is to give you two key skills: discovering the business needs and managing the conversation in a way that will enable you to collect precise and useful information. First and foremost, I promote the first point of the Agile Manifesto: "Individuals and interactions over processes and tools." If you tend to think that your clients do not know what they want, this book is exactly for you. 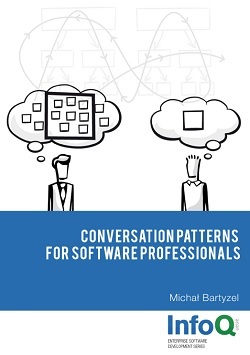 Michał Bartyzel has been working for more than a decade as a software developer, an instructor, a consultant, and a coach. He helps developers and teams to work better and more effectively, and to develop better software. He focuses mostly on facilitating the cooperation with business, refactoring, and improving work efficiency.